The world around us is changing rapidly – just think of things like Big Data, artificial intelligence or nanotechnology. And people are changing too. We are travelling more and more, for instance. The most conservative scenarios for 2050 assume growth in mobility of 23% for cars and 20% for trains. The central conurbation of the Netherlands – the Randstad – is getting busier and busier, as is traffic between the Randstad and Eindhoven, Maastricht, Groningen, Arnhem and Nijmegen. All this growth raises the question of how we are going to make our cities and surroundings accessible and good to live in. One answer is making public transport the obvious choice in urban areas. NS has drawn up a vision for this together with the carriers who operate in the major cities. We are also working with partners such as the ANWB and RAI to shape the future of mobility. Freedom of choice and being able to travel flexibly are keywords: travelling by train, carpooling or trams – whatever works best. That offers plenty of opportunities for public transport, but it does also demand substantial investments in the existing infrastructure. This will present the new cabinet with a major challenge. NS has its own role and responsibility in keeping the Netherlands accessible and in motion. We want people’s journeys to be as pleasant and as easy as possible, both now and in the future. Not only by train, but from door to door. After the irregularities in Limburg and the parliamentary inquiry into Fyra in 2015, we worked hard last year on regaining passengers’ trust. We have a new strategy that lets us focus on our core activities so that the performance for the passengers will improve in the longer term: aiming for better performance on the main rail network, world-class stations and helping make the door-to-door journey go smoothly. And 100% sustainable operation has been the motto for our electric trains in the Netherlands since 1 January 2017. That is why we are investing in new trains, expanding the capabilities of the journey planner, investigating alternative methods of payment and why we will be running six trains an hour between Eindhoven and Amsterdam from 2018 onwards. The fundamentals have to be in good order first, of course, and we want to make the daily train journeys as reliable as possible. This is plain to see in the results for 2016. Journeys by train were felt to be safer and we ran cleaner trains that were on time more often. After years of rebuilding work, Utrecht Centraal was officially reopened and we introduced new Sprinters in the completely renewed 2017 timetable. Things are not yet right everywhere for all passengers. 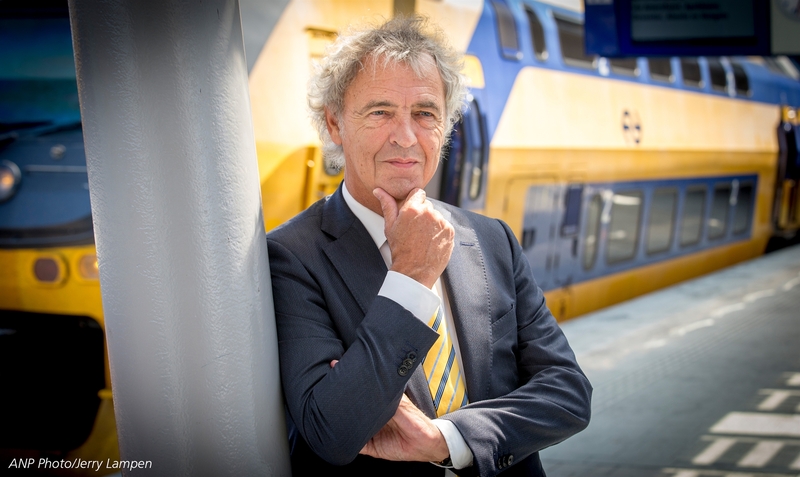 The punctuality of the HSL remained too far below par and the chance of getting a seat in the Netherlands during peak hours is going to remain a challenge over the coming years: the influx of new trains is gradual and the improved economic situation will result in about 2% more growth in passenger numbers. We also see some inevitable challenges at the ScotRail franchise of our Abellio subsidiary. We were however pleased to win the Greater Anglia franchise in England and the three franchises in Germany. We are continuing to invest in improvements and working on better satisfaction figures for our services. We are doing that together with our public transport partners, ProRail, the authorities, carriers, consumer groups and interest groups. Within NS, we are improving cooperation and working on a new way of how we treat one another. Our view is currently focused on 2019: getting a good result from the mid-term review at which NS will be measured against its targets. The authorities will then see whether we are meeting the agreements made for the main rail network franchise in the Netherlands. It is vitally important to our company that we retain the main rail network franchise. This includes keeping the stations and the HSL, which are an inseparable part of the main rail network and needed in the future too to enable us to offer passengers a good door-to-door proposal. The aim is to make sure NS remains a strong rail company. I have the fullest confidence in the route we have taken and I would like to thank all our staff for their huge efforts, involvement and contribution over the last year. We are doing it together, for more satisfied passengers.